I’ve been saving this little nugget, waiting for the right time to put a leash on it and take it out for a spin. 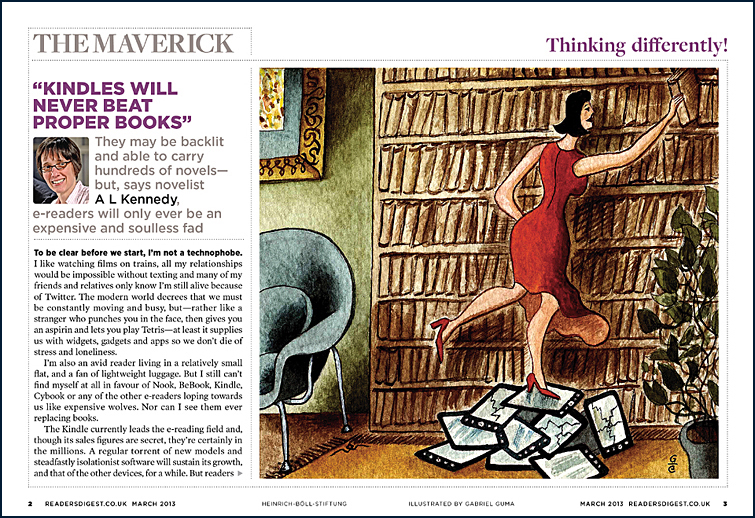 It’s a snazzy page spread from the 75th anniversary issue of the British edition of Reader’s Digest, featuring an illustration by yours truly for a brisk, acute article examining the pros and cons of Kindles vs. printed books. (If you’re curious about how this assignment came to be, I invite you to read a post I wrote back in late January.) Feel free to click on the spread to see it bigger. The entire issue is a joy to look at, with a compact but smartly designed format and terrific production values. It once again proves that print is alive and kicking; and it demonstrates how it still has plenty to offer when talented graphic designers and art directors make the most out of the tactile attributes and visual dimensions of the medium.